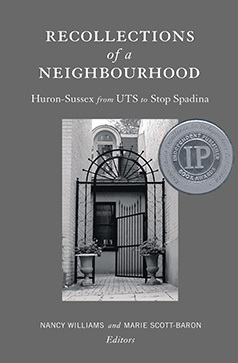 260 pages • paperback • 5.5" x 8"
In this ambitious new geographical memoir, residents of a historic Toronto district share personal recollections of their defiance in the face of destruction and the special moments of daily life that have made their community unique and lasting. Words Indeed Publishing proudly announces Nancy Williams and Marie Scott-Baron, editors, Recollections of a Neighbourhood. This lavishly illustrated and lively volume begins with semi-feudal land grants in the 1790s and culminates in the creation of the Robarts Library and Rochdale College and the sudden and dramatic death of the would-be Spadina Expressway. Part history and part memoir, Recollections of a Neighbourhood gives the reader a sense of what and who made this neighbourhood so special. Academics, writers, activists, artists, neighbours, working together to build and preserve a Toronto of which they, and we, could be proud. With scores of photographs, many by designer Anne Vellone of vellonedesign.com, specially commissioned maps from Mariange Beaudry of the University of Toronto Cartography Office, and reminiscences by residents spanning over 60 years – ‘from UTS to Stop Spadina’ – Recollections reveals the history and the texture of life in a lively, close-knit, somewhat bohemian Victorian neighbourhood in central Toronto. Words Indeed launched Recollections of a Neighbourhood 15 December 2013 in the Great Hall at Hart House. In the spring, the book won a silver award for Best Independent Publisher (‘IPPY’ awards based in the U.S). Writers and publishers from all over Canada and the United States had submitted about four thousand new titles for the prizes.